Madeira's sister island, Porto Santo, lies 42 miles (68km) northeast of its larger sibling and was actually discovered before Madeira itself. In 1418, Portuguese mariners João Gonçalves Zarco and Tristão Vaz Teixeira stumbled across it while running from a storm. Unlike Madeira, Porto Santo is rather bleak and barren. However, its southern coast is bordered by a lovely 5 mile (8km) stretch of beach fringed with soft golden sand. This, together with its temperate climate, has turned Porto Santo into a popular holiday resort. 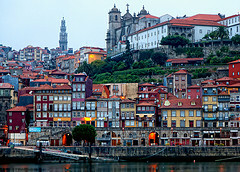 The main town on the island is Vila Baleira, which was visited by Christopher Columbus. There is a scenic park in the town, some cafés and pretty cobblestone streets lined with stucco houses. Visitors can catch one of several regular daily flights to and from Madeira, or ferry from Funchal harbour to Porto Santo.